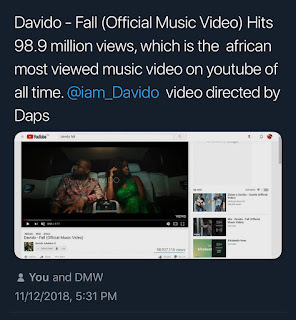 Just few days after the DMW boss released his new song "Wonder woman", the blogger Ayo Jaguda followed up with the music and claimed that Davido bought fake views on his YouTube page for the song as it hits a million views in less than a day. "Davido - Fall (Official Music Video) Hits 98.9 million Views, which is the African most viewed music video on youtube of all time. @iam_Davido video directed by Daps"
He then went ahead to caption it "NO CAP! Where dem dey", could this be a message to Ayo?